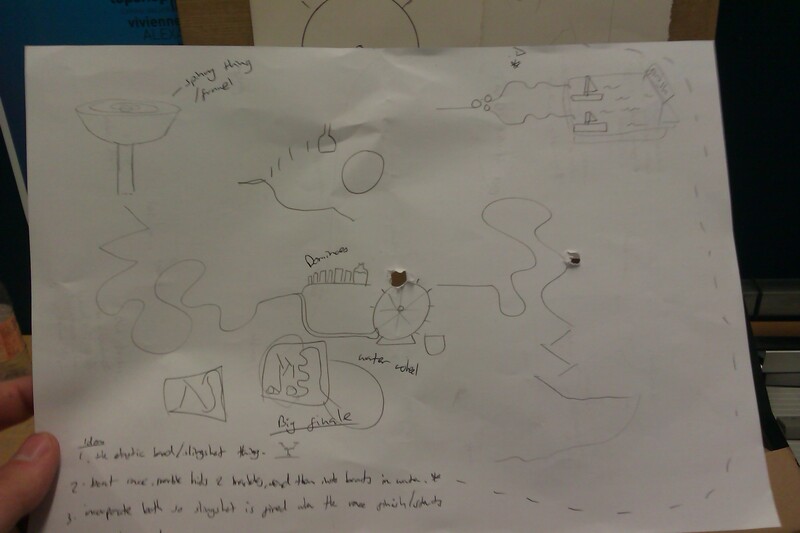 For the marble run project, our group started by brainstorming ideas for themes that are marble run could be. The theme we chose was originally a water park/amusement park, so we did another brainstorm but for what sort of content/’obstacles’ there would be in the marble run, rather than it just being a plain run with no innovation. Once we had a basic idea of what sort of thing were going into the marble run, I drew a few sketches on how some of the aspects would work. 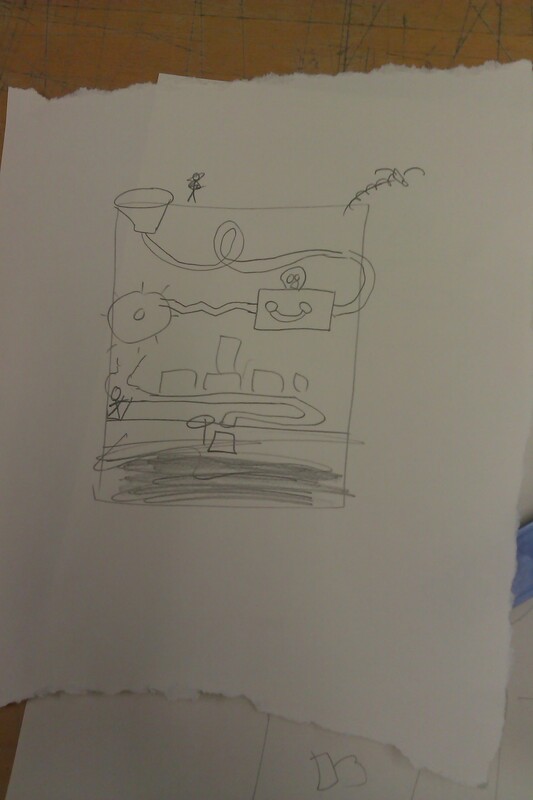 The sketches below are rough ideas of how a water wheel and a catapult/big finale idea would be made. 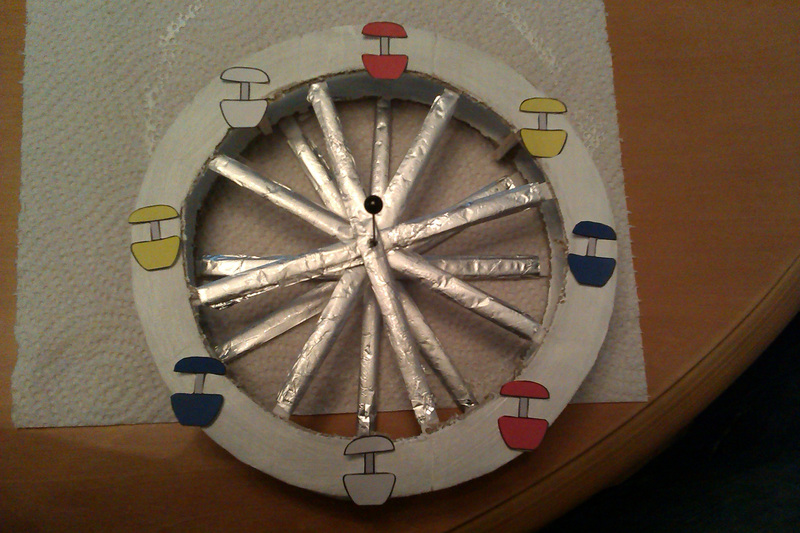 Water wheel: For the water wheel, I would have to make the wheel out of something that won’t get damaged when wet. Then the marble would have to hit something (most likely dominoes) to knock a water bottle over. The water will then turn the wheel and that will lift another marble onto the wheel so it can continue on the run. Catapult idea: This idea came to me when I was thinking about the Lord Of The Rings theme earlier, about how this mechanism could be in a volcano and then set off shooting confetti or something similar out the top, resembling the Mordor scene for Lord Of The Rings. To make it, the main mechanism would be 1 or 2 elastic bands connected to the top of whatever the catapult is n, with the other end connected to a holder for the ‘ammunition’ (confetti). There would then be a piece of string or fishing wire connected to a trigger on the marble run (most likely a small hook of some sort). The marble would hit the trigger and release the catapult, the stretch of the bands would then shoot the ‘ammunition’ out of the top. This would be a big finale as I thought it would appeal to the people watching it more and be a little more exciting. 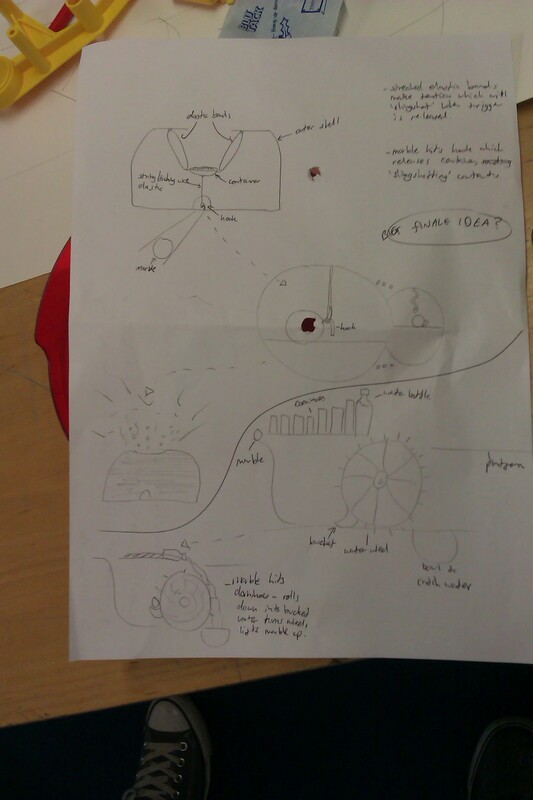 As you can probably tell, the catapult idea is quite complicated and with the other water powered mechanisms, like the wheel, we thought we were getting a bit carried away and realized the time scheduled we had. So we scrapped the catapult idea. Also, instead of having the wheel powered by water, we thought it would be better (but also look as good) with just the marble powering the wheel, so when it drops onto it, the momentum should spin the wheel, allowing the marble to continue. 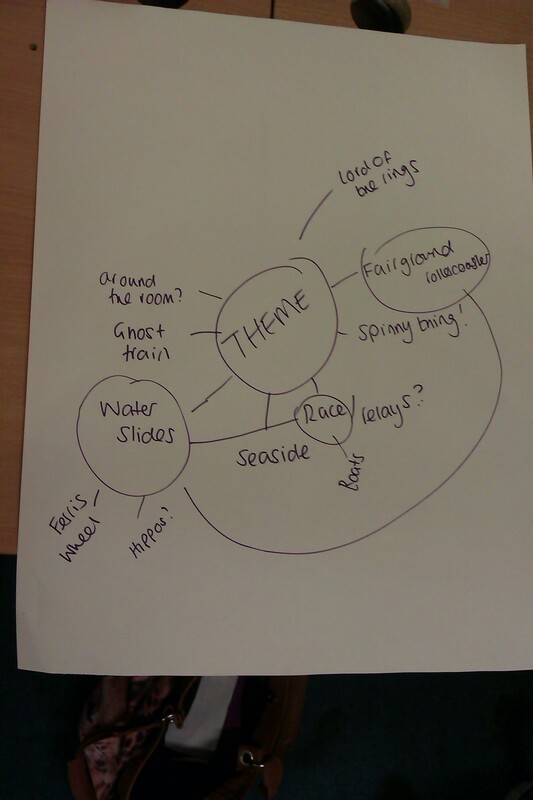 After we agreed on not using the water wheel or the log flume idea, we decided to slightly alter our theme, this time to a seaside, amusement park idea. 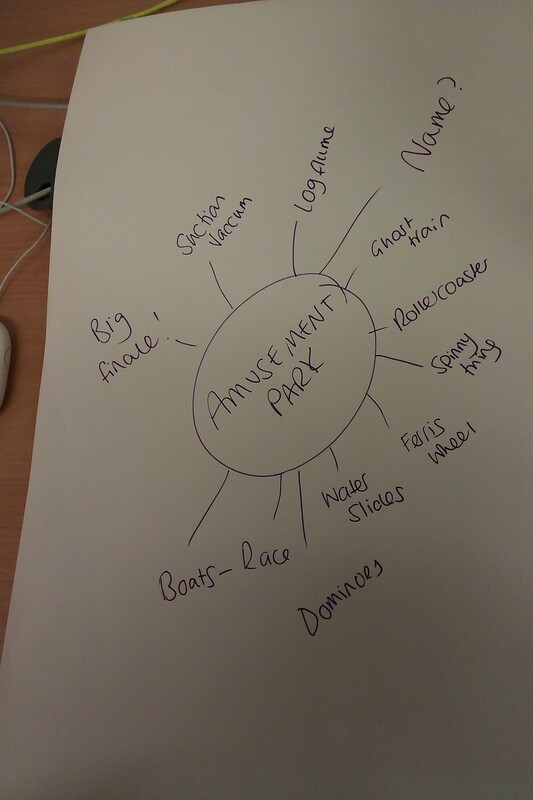 We slightly altered the ideas we already had and added some new ones to give it more of a seaside feel. 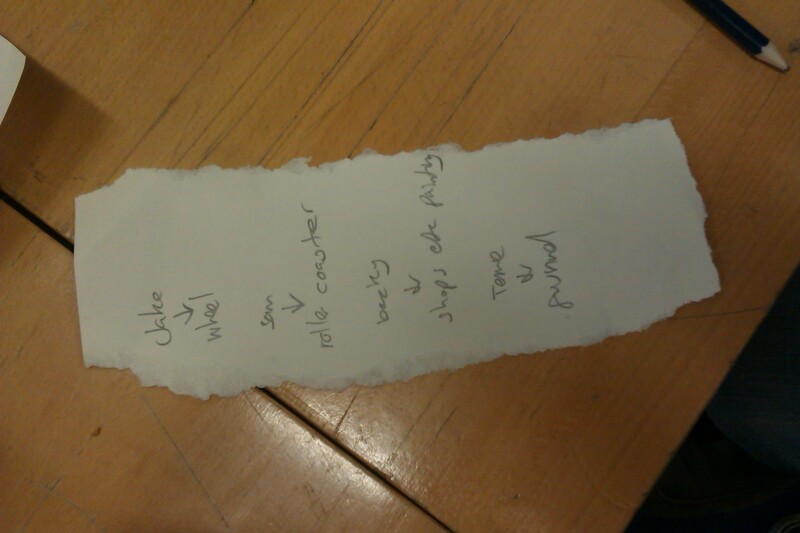 Once we knew what we where putting in the marble run, we drew a very rough running order plan, while still figuring out how it would work (picture above). 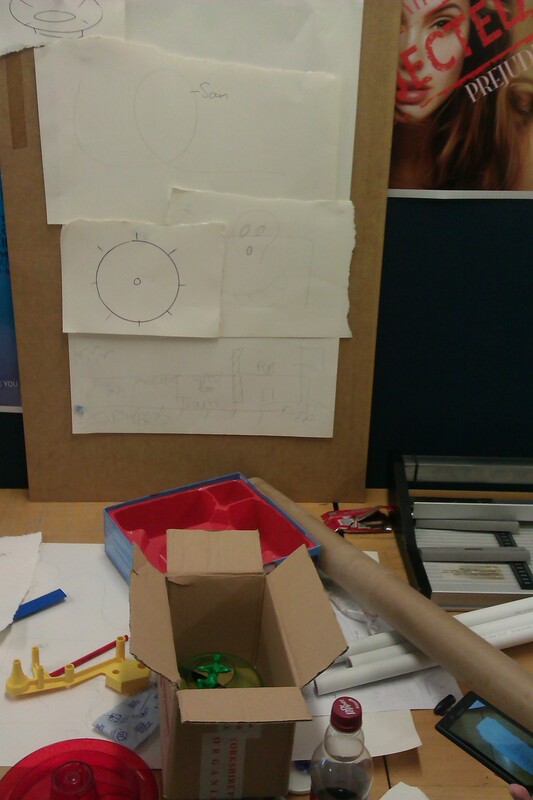 We then went and found a few thing that we could use to make parts or the marble run with. We found a large wooden board to mount it all on, some tubes, part of a Kerplunk set that we could use as a spiral/cone thing, and also a few other bits. We then drew the main parts of the marble run on pieces of paper and tried different layouts by moving the papers around to figure out an order. 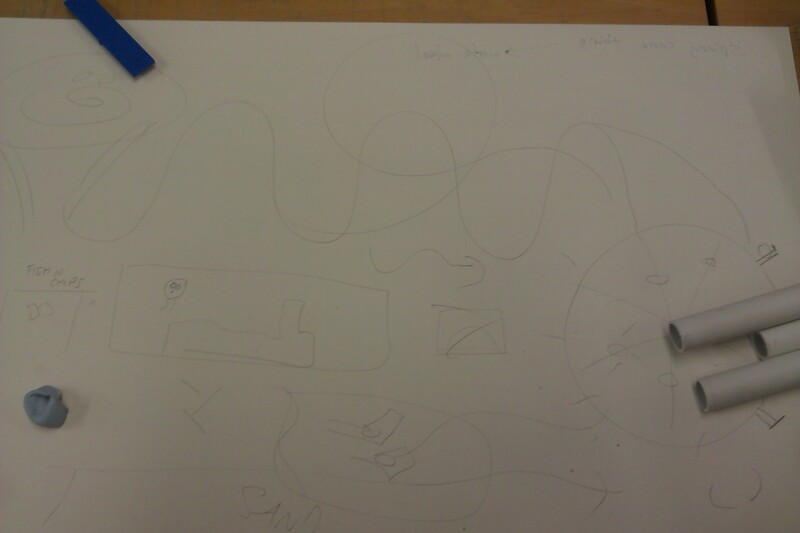 Above is the condensed sketch of the layout. We agreed on an order to go with, but we may have to slightly alter it when we come to actually making it. We then made a task list for the individuals in our group to focus on making/researching (above). This will help to spread the load and hopefully get it done in time. I researched into Ferries Wheels to get an idea of what they looked like. 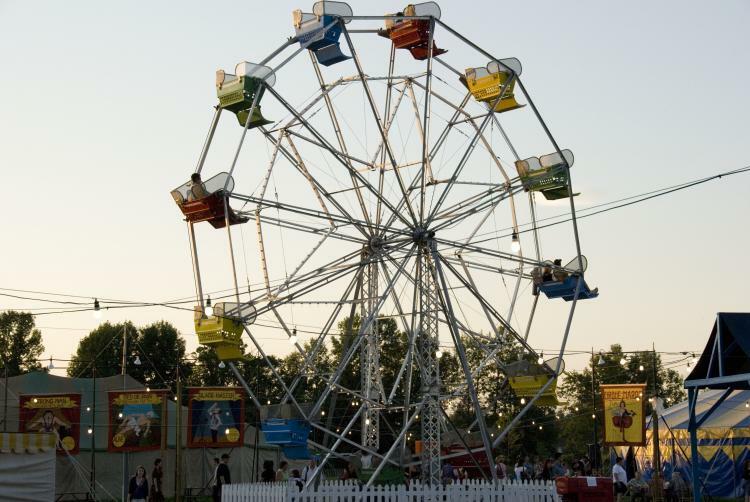 I looked at pictures of the internet but I have seen Ferris Wheels before so I already had an idea of how to make one. 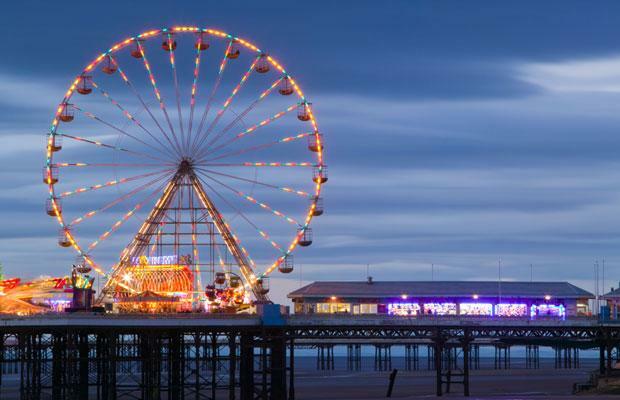 I looked mainly at smaller scale Ferris Wheels because those are the type that I have seen at seaside amusement parks and on piers. 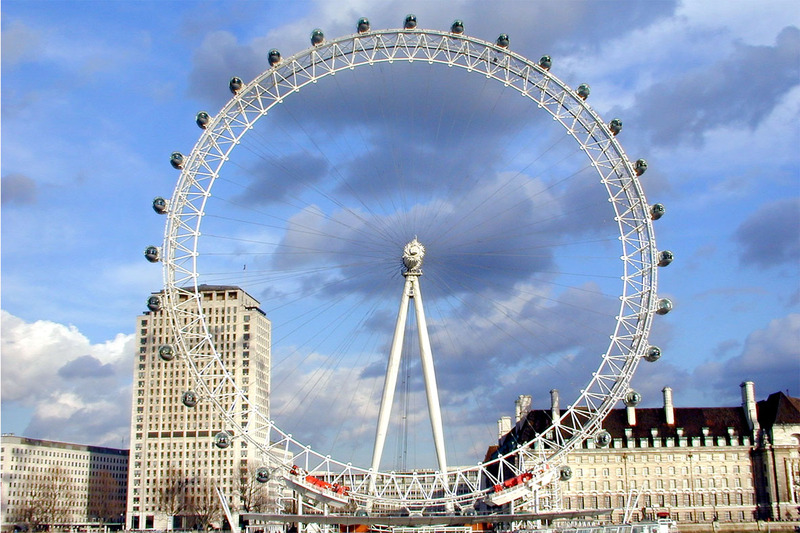 But I also looked at larger scale wheels like the London Eye. Other then the seats varying slightly, all the designs were pretty much the same, numerous metal ‘spokes’ holding it all together and the stand in the middle which the wheel is on. But because we were more than likely mounting the wheel on a backboard, I wouldn’t have to make the stand part. 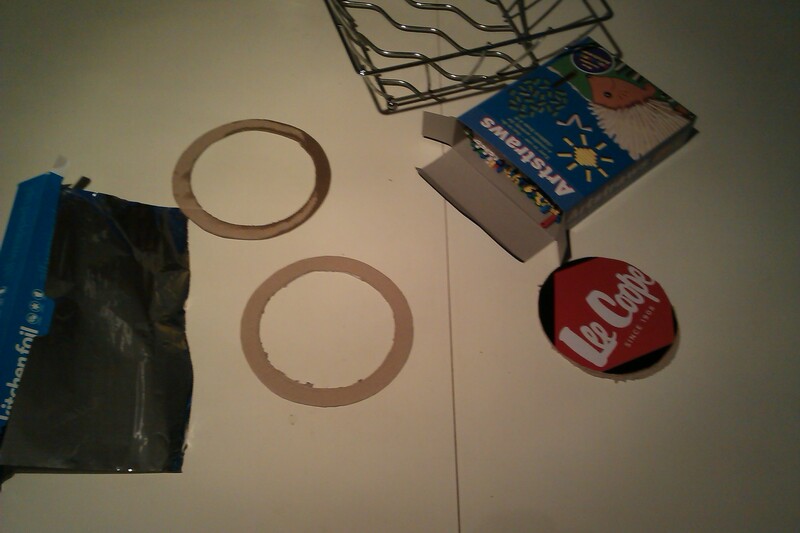 Firstly, I cut out the circles from a shoe box to make the main body. I gathered the rest of the materials I would need (tin foil & paper straws). I then cut the straws to size and wrapped them in tin foil to make them look more like metal. I then used tape to stick them to the cardboard. I made to because the marble would fall onto a slat between the two. Also it made it look more dimensional rather than flat. 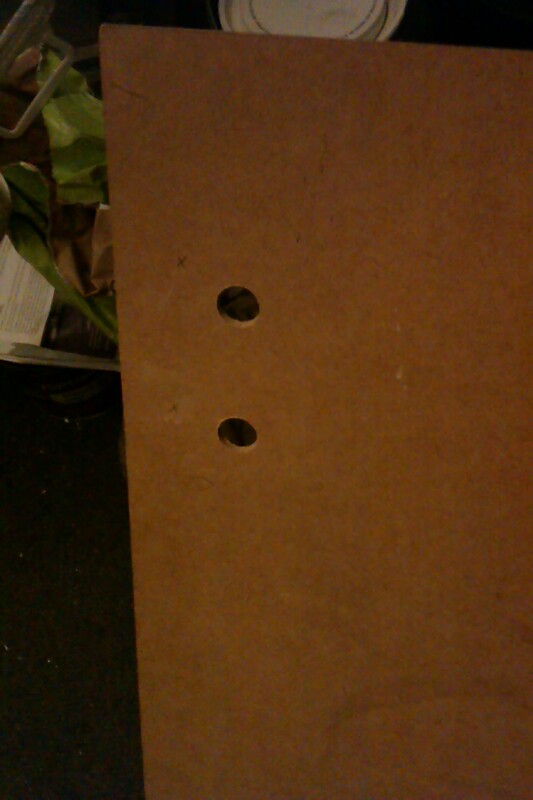 I cut up a bit of thin plywood to make the slats. I used this instead of card because it was stronger. 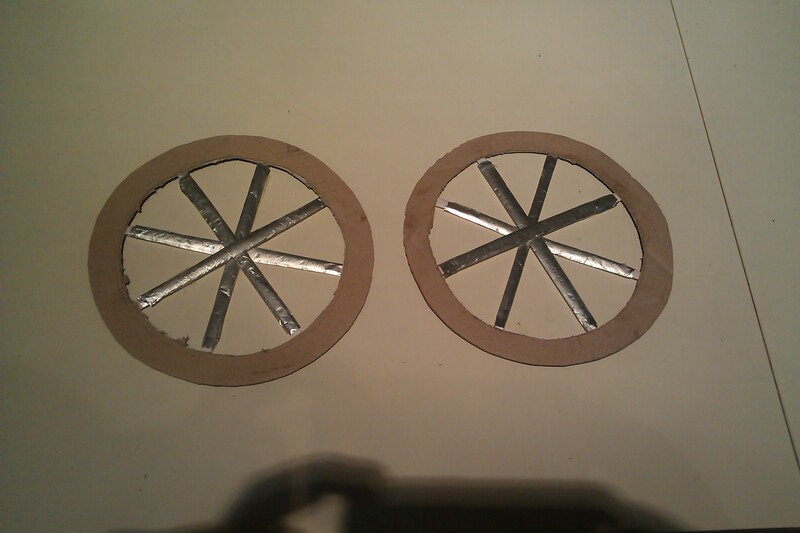 I then glued them to the wheels. I found a pin to use as the ‘spoke’ which the wheel spins on. I poked it through the straws, then that is how I am going to attach it to the board. I just have to add some colour. 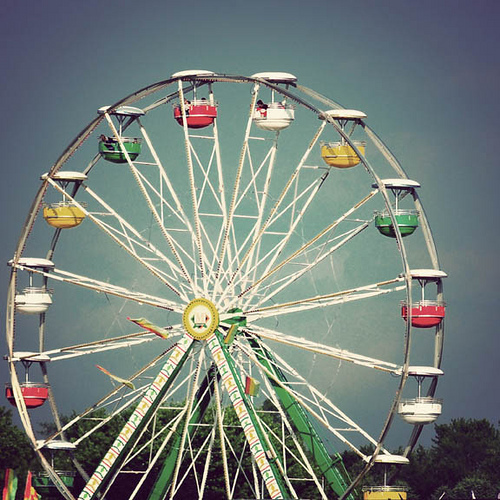 I added made the seats that go on the Ferris wheel on Photoshop and printed them of then stuck them onto the wheel. 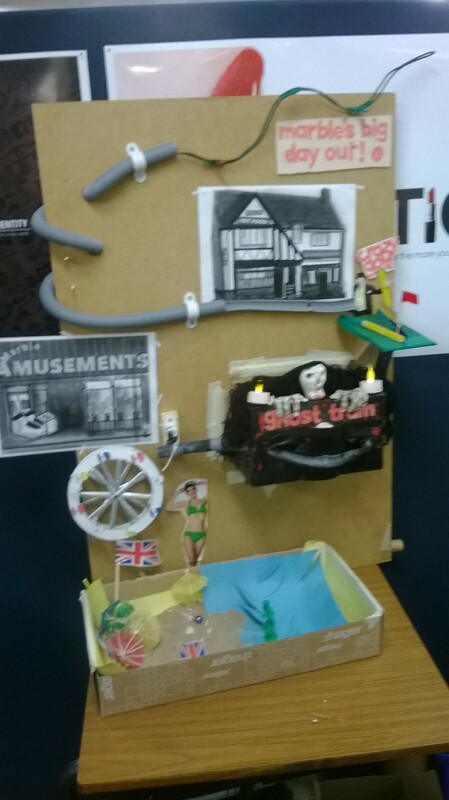 While my job was to make the Ferris wheel, Sam got on with making the roller coaster tracks out of some bendable garden cable, and Becky put the details on to the ghost train section , and also drew some seaside themed buildings, like fish & chip shops and amusements etc, which we could use as decoration. I also took the back board we were mounting the marble run onto home so I could drill a couple of holes into it so the roller coaster would go through the holes and interact with the board. Once we had the holes in the board, and the main parts of the marble run, we started to compile it all and try to put it on the board. We did have trouble figuring out what to use for the track which was annoying because it was the main part. The garden cable worked well for the roller coaster part but not really for the other track, Becky tried using clay but that wouldn’t really hold the shape till it dried, we also experimented with glow, but they didn’t really work. We started to get quite annoyed with it until I thought it would be a good idea to check at the Homebase down the road to see if we could find anything. So me and Sam went and we found some bendable outlet hose that we could cut up and bend, and the marble fit through it. Before we had our marble run filmed, we added the finishing touches like the building picture Becky made, and the Ferris wheel. 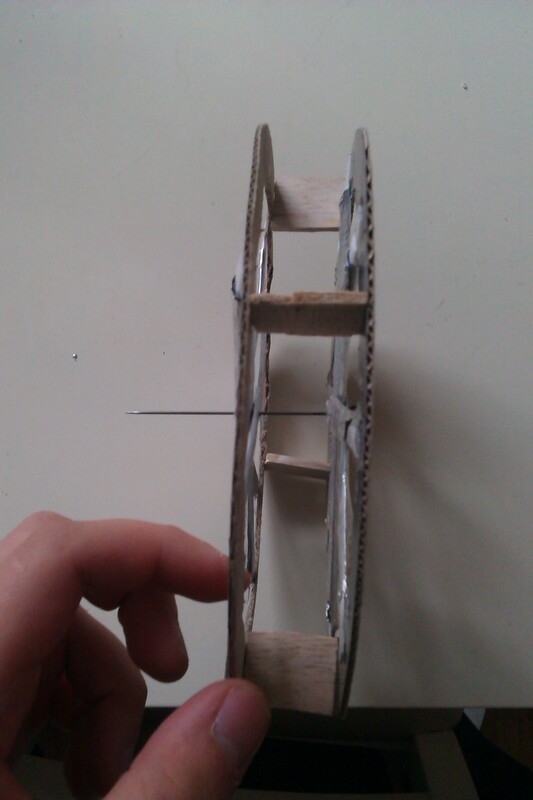 The ferris wheel was tricky to put on because first we had to make the hole in the board, then pin the wheel into place, but then in was weighed down so we had to counterbalance it so the wheel would catch on the board and stop spinning. We also had setbacks printing out in colour so they were in black and white. Overall I think the project went well. I beleive we worked well as a group and easily spread the work load across the group. I do think we came up with some ideas, but the limitations we had (time, resources etc) kind of held us back a bit. So I don’t think the marble run was as good as it could have been. Also, we were a team member short in most of the sessions so that put extra strain on us to get it finished in time. The marble run lasted 9 seconds from start to finish and there wasn’t any major faults with it, other than the Ferris wheel was a tad miss-alligned so it stop spinning when it got caught on the board. But on reflection, it could have been worse.